Thunderstorms in Tuesday’s forecast – Welcome to Wyandotte Daily! Thunderstorms are likely to move through the region this afternoon, according to the National Weather Service. The chance of precipitation in Wyandotte County is 50 percent, with thunderstorms most likely after 2 p.m., the weather service said. These storms may include gusty winds of 40 to 50 mph, and isolated heavy downpours that lead to local flooding, according to the weather service. More thunderstorms will be possible Wednesday through Friday, the weather service said. 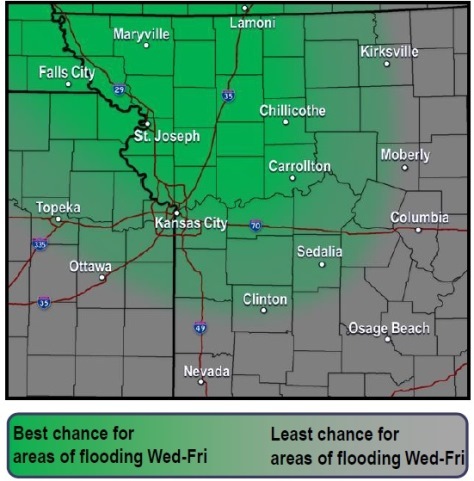 Widespread severe weather is not expected, but gusty winds and heavy rain in places will be possible, with some local flooding possible through the week. 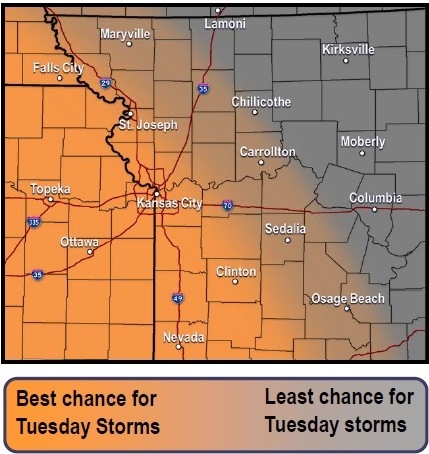 In Wyandotte County, today’s high will be near 90, with an east northeast wind of 5 to 8 mph and a 50 percent chance of thunderstorms after 2 p.m., the weather service said. Tonight, there is a 30 percent chance of showers and thunderstorms, mainly after 1 a.m., according to the weather service. The low will be around 70 with an east northeast wind of 5 to 7 mph. 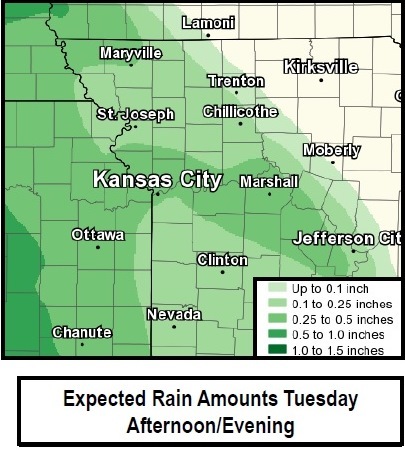 Between a tenth and quarter-inch of rain is expected. Wednesday, there is a 30 percent chance of showers and thunderstorms, with a high near 88, the weather service said. There will be a southeast wind of 5 to 9 mph. Between a tenth and quarter-inch of rain is expected. Wednesday night, there is a 40 percent chance of showers and thunderstorms, with a low of 72 and a southeast wind of 6 to 8 mph, according to the weather service. Between a half-inch and three-quarters inch of rain is possible. Thursday, there is a 20 percent chance of showers and thunderstorms before 1 p.m., with a high near 95 and a southwest wind of 5 to 9 mph, the weather service said. Thursday night, there is a 40 percent chance of showers and thunderstorms after 1 a.m., with a low of 73, according to the weather service. Friday, the high will be 92, with mostly sunny skies, the weather service said. Friday night, the low will be around 69 with mostly clear skies, according to the weather service. Saturday, expect sunny skies and a high near 90, the weather service said. Saturday night, it will be mostly clear with a low of 70, according to the weather service. Sunday, skies will be mostly sunny with a high near 90, the weather service said. Sunday night, expect a low of 71 with partly cloudy skies, according to the weather service. Monday, skies will be partly sunny with a high near 89, the weather service said.